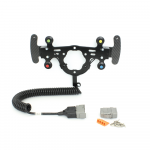 The four switch steering wheel plate can be mounted between the OMP Targa steering wheel and quick release. Four momentary push buttons (push-to-talk) can be.. 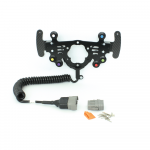 The six switch steering wheel plate can be mounted between the OMP Targa steering wheel and quick release. Four momentary push buttons (push-to-talk) can be..